This page shows how to construct a triangle given two sides and the included angle with compass and straightedge or ruler. It works by first copying the angle, then copying the two line segment on to the angle. A third line completes the triangle. 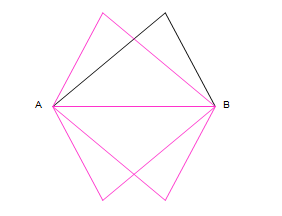 It is possible to draw more than one triangle has the side lengths and angle measure as given. Depending on which line you start with, which end of the line you draw the angles, and whether they are above or below the line, the four triangles below are possible. All four are correct in that they satisfy the requirements, and are congruent to each other. The image below is the final drawing above with the red items added. 2 Line segment ML is congruent to AC. Drawn with the same compass width. 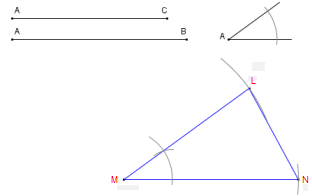 3 The angle LMN is congruent to the angle A Copied using the procedure shown in Copying an angle. See that page for the proof. 4 Triangle LNM satisfies the side lengths and angle measure given. Click here for a printable worksheet containing two SAS triangle construction problems. When you get to the page, use the browser print command to print as many as you wish. The printed output is not copyright.